Totally forgot yesterday was Wednesday, just that kinda week. Boyfriends parents are here visiting so sewing has been minimal, whatever time I can grab has been spent finishing quilting my last christmas gift (!!) and working on Hurricane Sandy Relief quilts. Speaking of, finished another one! I mailed them to NJ today so they'll be there waiting! 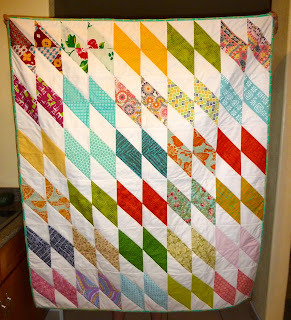 The rest of my fabulous quilters are posting in the flickr group! Simply Color Ombre Yardage is available in the shop! Hehe, my quilt looks just like that! Same layout and green binding. I'm amazed you are getting anything done right now, much less 3 quilts plus all those other projects you are working on! Another good one! I didn't think you wanted any more, so I hadn't offered, but I can send you some if you want...just let me know. 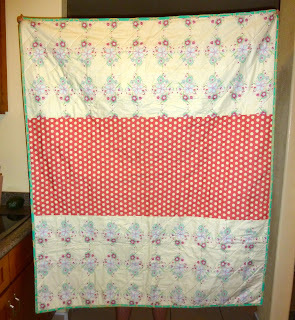 yay for another completed quilt. Can't wait to hear you share after you give all these away! Wow!! 12 quilts! That's awesome :) You are doing great things! Beautiful quilt! How generous of you. Love all the Sandy quilts that you have! If you need any more blocks or some bindings please let me know. Yay for another quilt for a good cause!! Baby Sister isnt a Baby!